Wood consolidation is often required when there has been excessive damage through overexposure to moisture, insect infestation, multiple reupholstering campaigns, and other causes to ensure that the wood element is structurally sound. Joint re-adhereing occurs primarily due to the aging of the adhesive used to secure the joints coupled with overuse and poor previous repairs. Multiple forms of adhesives and adhesive barriers are utilized in our treatments to ensure that the object is preserved and can be utilized as the current custodian requires whenever possible. Wood is hydroscopic and absorbs and releases moisture with the changes in the humidity in the environment in which it is housed. 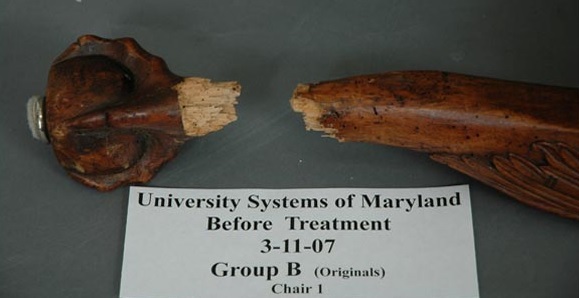 This can cause the development of compression set shrinkage cracks and other fractures in wood elements particularly when that wood element is bound. Below: These images show before and after treatment of a Russian Neo-Classical style inlaid mahogany silver chest. Above and Right: Before and after treatment images of one leg from a larger set of 14 English George II Period Ca. 1745 walnut upholstered dining chairs, which suffered severe damage from powder post beetle infestation.